Posted on August 23, 2018 August 30, 2018 by Dr James Herrera, Ph.D.
TriCEM congratulates Jeremy Ash, Ph.D. candidate in Bioinformatics at North Carolina State University. 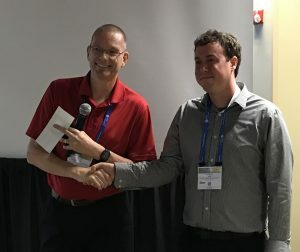 Jeremy won the CINF award for the second year in a row during the American Chemical Society annual meeting. This is the first time a student has won the award twice! Jeremy’s research focuses on protein-ligand interactions, specifically the ERK1 and 2 proteins which are important for signalling cell proliferation, as in cancerous cells. See more about his research here. Jeremy was supported during his research by a TriCEM graduate fellowship.